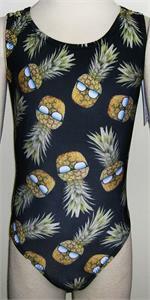 We are proud to offer Foxy's Leos gymnastics leotards. The fit and comfort of these open back gym leos are amazing! The nylon fashion fabrics are unique with the coolest, most original designs - everyone will ooh and ahh when you walk into gymnastics training! Foxy's Leos sizing is different from most other manufacturers. See bottom of page for detailed information. 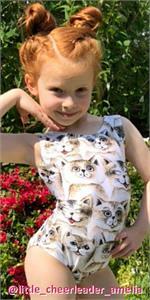 Happy Cats - infused nylon spandex open back tank gymnastics leotard. 8 years. Happy Cats - infused nylon spandex open back tank gymnastics leotard. 10 years. 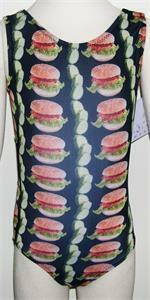 Happy Cats - infused nylon spandex open back tank gymnastics leotard. 12 years. 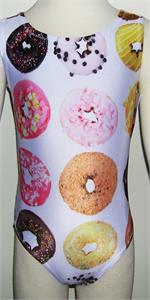 Foxy’s leotards come in 6 child sizes and 4 adult sizes. Foxy’s sizes are true to actual clothing fit. For example, the pant or jean size that your child is wearing will be the size leotard she should wear. Exception: Go up one size for a long torso or fuller body. The sizing charts below can be used as a general guide, but proper fit is a matter of personal taste and may vary in different fabrics. The girth measurement is the most important sizing tool. Begin with your tape measure on the shoulder, bring it down the chest, down the stomach, in between the legs, up the back to the starting point on the shoulder – so you circle the entire body.